The eighteenth century was the first great age of the travelling virtuoso, with violinists—particularly Italian violinists—leading the way. Early in the century, such virtuosi as Geminiani, Veracini and Locatelli spent much of their lives outside Italy, followed later by Giardini, Lolli, Giornovichi, and many others. They sacrificed the relative security of an Italian court post or opera orchestra position for the prospect of fame and fortune in the capitals of northern Europe—alluring cities like Paris, London or St Petersburg. They might settle for many years in one place, especially if lucrative aristocratic patronage was forthcoming, or they might prefer to keep on the move on something like a modern concert tour. It was a precarious lifestyle. There was plenty of opportunity for financial disaster, especially if the violinist dabbled in risky operatic ventures. He was subject to the approval of his patrons and to the whims of fashion, not to speak of political upheavals—Viotti was among many who fled to London from the turbulent Paris of the early 1790s. However, a virtuoso of European reputation could with judgment and a little luck be assured of a more than comfortable living in the north, perhaps eventually retiring to his homeland with the spoils of his success. Giovanni Battista Viotti (1755–1824) was one of the last to follow this lucrative trail. (With the dazzling exception of Paganini, the nineteenth century proved a lean period for the Italian violin school.) He studied with Pugnani in Turin, and after five years in the Royal Chapel orchestra he joined his teacher on an ambitious European tour. They visited Dresden, Berlin, Warsaw and St Petersburg, with Viotti styling himself ‘pupil of the celebrated Pugnani’. His Paris debut, however, proved a turning-point—a concerto performance at the prestigious Concert Spirituel on 17 March 1782 caused a sensation. Critics remarked on his extraordinary power and technical precision, but it was his expressive and sonorous adagio playing that impressed most. Viotti was immediately hailed as the finest violinist in Europe. Thus began a decade in Paris of immense importance to violin-playing. Viotti’s grand style, blending a bolder brilliance with a more serious and intense expression, marked a move away from decorative rococo elegance. Both his performances and his music influenced a whole generation of violinists—Rode, Baillot, Kreutzer, to name a few—and even Beethoven shows an awareness of Viotti’s style in his own violin concerto. This was also a period of changes in the instrument itself, as makers responded to the demand for more volume and for richer expressive resources. The 1780s saw in particular the perfecting of the modern bow by François Tourte—a development with which Viotti has traditionally been linked. Although his exact role remains unclear, the association is in itself some indication of his reputation. Only eighteen months after his Paris debut, Viotti retired from public performance there—in 1784 he was appointed to the service of Marie Antoinette at Versailles, and later he went into opera promotion, an undertaking accompanied with unusual success. He continued, however, to compose violin concertos, completing nineteen before he left for London. No 13, published in 1788, was probably written for Versailles. The remaining ten concertos date from his London years—among them the celebrated No 22 which that stern critic Brahms described as ‘masterly’ and a particular favourite of his. A more shadowy figure, and certainly a less influential one, was Viotti’s exact contemporary Federigo Fiorillo (1755–after 1823). Though he was born in Germany and at first preferred the mandolin, Fiorillo’s later career as a violin virtuoso closely resembled that of Viotti. First there was an extended tour, taking in St Petersburg, Poland, and Riga; then in 1785 he made his Paris debut, before settling in London three years later. 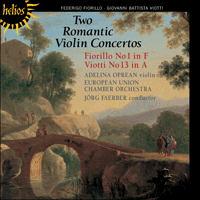 Like Viotti, Fiorillo composed a great deal of violin music, including the 36 Caprices well-known to students today. His four concertos are much less familiar; the first was published in Paris in 1789. We are indeed fortunate that so many violin concertos of this period survive at all. Virtuosos, who generally played their own compositions, guarded them jealously, carrying around sets of manuscript parts with them; most of these are now lost. However, this natural prudence competed with a strong commercial interest: the music-publishing business was rapidly expanding, and violinists seized the opportunity to have their music printed. Catalogues of the time do contain a large amount of domestic piano music and songs, including trivia like The Battle of Prague with its cannon-fire and cries of the wounded. But publishers also found room for such major concert works as Haydn’s symphonies and, more surprisingly, for the most virtuosic concertos. Much of this repertoire presented hair-raising technical difficulties, at least in pre-Paganini terms; had Mozart’s violin concertos been published during his lifetime, they would have stood out as technically quite undemanding. It is difficult to imagine gentleman amateurs making much of these taxing concertos, but the fact that they bought them has certainly ensured their survival. Paris publishers were particularly prolific in this area; in London, violin concertos often appeared in more saleable arrangements for piano. Both Viotti and Fiorillo typically attempt to capture the attention by a mixture of brilliant virtuosity with expressiveness and melodic appeal. Fiorillo’s solo entry not only decorates the initial orchestral idea but also carries it into the higher reaches of the E string. Viotti finds an even more arresting gesture, the violinist entering unaccompanied with an assertive version of the opening bass line; he also selects the E string, but soon transfers the idea down to the G string, a favourite timbre which Viotti did much to popularise. The two first movements follow a broadly similar course; both set off bravura display with contrasting melodic paragraphs, including a lyrical second subject and a more passionate minor-key episode. Viotti explores minor keys further in the development sections, with signs of the drama and turbulence to come in his later concertos; and it is perhaps significant of his serious approach to the concerto form, and his disdain of technical display for its own sake, that he does not even give the traditional opportunity for a cadenza. The slow movement was usually either a graceful French romance, with its regular melody and easily-grasped structure, or a long-breathed expressive cantilena. Fiorillo’s Larghetto has something of the romance character about it, though the charming melody is more than a little reminiscent of Mozart. Viotti was by this date moving away from standard types, and his Andante, while retaining a simple design, is more concerned with the noble cantabile natural to the Tourte bow; the warm sonority of the movement stems directly from the sound of the horns. Last movements were by this date almost universally rondos, featuring a recurring melody with some characteristic rhythm. Fiorillo finds a catchy tune in 2/4 time, which alternates with extrovertly showy episodes; one of these makes striking use of the horns in dialogue with the soloist, an unusual idea at a time when the wind instruments were often regarded as optional. Viotti prefers the triple time of the minuet—yet this is no stately court dance but rather a jaunty polonaise. Piquant national tunes were common enough as rondo themes, but this particular movement created a fashion for the polonaise finale; and, in a curious reversal of the norm, the melody itself became highly popular as a song. Again the episodes contain some brilliant passagework (one idea is a flashy combination of trill and dotted rhythm), but Fiorillo finds time once more for a minor-key contrast. There is one final surprise—the last time the rondo theme recurs it is heard in the orchestra, accompanied now by that distinctive figure in the solo violin part. Le XVIIIe siècle fut le premier âge d’or des virtuoses voyageurs, les violonistes (surtout italiens) ouvrant la voie. Au début du siècle, des virtuoses comme Geminiani, Veracini et Locatelli vécurent en grande partie hors d’Italie, bientôt imités par Giardini, Lolli, Giornovichi et maints autres. Ils sacrifièrent la relative sécurité d’un poste dans une cour italienne ou dans un orchestre d’opéra à la perspective de renommée et de fortune dans les capitales d’Europe septentrionale—des cités attrayantes, telles Paris, Londres ou Saint-Pétersbourg. Ils pouvaient demeurer longtemps en un même endroit, surtout s’il y avait un mécénat aristocratique lucratif, ou préférer bouger sans cesse dans une sorte de tournée de concerts moderne. Ce style de vie était précaire, avec de multiples risques de désastre financier, surtout si le violoniste se lançait dans des projets opératiques hasardeux. Il était, en outre, soumis à l’approbation de ses mécènes et aux caprices de la mode, sans parler des bouleversements politiques—Viotti fut de ceux, nombreux, qui préférèrent Londres au turbulent Paris du début des années 1790. Toutefois, un virtuose de réputation européenne pouvait, avec un peu de discernement et de chance, être assuré d’une vie plus qu’aisée au Nord, quitte à regagner, ensuite, sa patrie avec les bénéfices de son succès. Giovanni Battista Viotti (1755–1824) fut l’un des derniers à emprunter cette voie lucrative. (À l’exception étincelante de Paganini, le XIXe siècle s’avéra peu propice à l’école violonistique italienne.) Il étudia avec Pugnani à Turin et resta cinq années à l’orchestre de la Chapelle royale avant de rejoindre son professeur pour une ambitieuse tournée européenne, qui passa par Dresde, Berlin, Varsovie et Saint-Pétersbourg. Il se faisait alors appeler l’«élève du célèbre Pugnani», mais ses débuts parisiens vinrent tout changer: un concerto donné au prestigieux Concert Spirituel, le 17 mars 1782, fit sensation. Les critiques, qui soulignèrent son extraordinaire puissance et sa précision technique, mais furent surtout impressionnés par son jeu adagio, expressif et sonore, le saluèrent d’emblée comme le meilleur violoniste d’Europe. Ainsi débuta une décennie parisienne d’une grande importance pour le jeu du violon. Le style grandiose de Viotti, mariant une brillance vigoureuse à une expression davantage sérieuse et intense, rompit avec l’élégance rococo décorative. Ses interprétations et sa musique influencèrent toute une génération de violonistes—Rode, Baillot, Kreutzer, pour n’en citer que quelques-uns—, et Beethoven lui-même se montra sensible au style de Viotti, dans son propre concerto pour violon. Cette période fut également émaillée de changements dans l’instrument même, car les luthiers satisfirent aux demandes de volume accru et de ressources expressives plus riches. Les années 1780 virent notamment le perfectionnement de l’archet moderne par François Tourte—un développement auquel Viotti est traditionnellement associé, ce qui est, en soi, un signe de sa réputation, quoique son rôle exact demeure obscur. Dix-huit mois seulement après ses débuts parisiens, Viotti abandonna les interprétations publiques pour entrer au service de Marie-Antoinette, à Versailles (1784), avant de se lancer dans la promotion de l’opéra, avec un succès inhabituel. Il continua cependant de composer des concertos pour violon, en achevant dix-neuf avant son départ pour Londres. Publié en 1788, le no13 fut probablement écrit pour Versailles. Quant aux dix concertos restants, ils datent de ses années londoniennes (tel le célèbre no22, l’un des préférés de Brahms, qui le qualifia d’un sobre «magistral»). Personnage plus flou, Federigo Fiorillo (1755–après 1823) fut certainement moins influent que Viotti, dont il est l’exact contemporain. Bien que né en Allemagne et ayant d’abord préféré la mandoline, Fiorillo fit une carrière de violoniste virtuose étrangement proche de celle de Viotti. Elle débuta par une grande tournée embrassant Saint-Pétersbourg, la Pologne et Riga; puis, en 1785, Fiorillo fit ses débuts parisiens avant de s’installer à Londres, en 1788. À l’instar de Viotti, il composa beaucoup de musique pour violon, dont les trente-six Caprices bien connus des étudiants actuels. Ses quatre concertos sont bien moins célèbres—le premier fut publié à Paris, en 1789. Par chance, quantité de concertos pour violon de cette époque nous sont parvenus. Les virtuoses, qui jouaient généralement leurs propres compositions, les gardaient jalousement, emportant avec eux des corpus de parties manuscrites, désormais presque tous perdus. Toutefois, cette prudence naturelle fut mise à mal par un fort intérêt commercial et les violonistes, confrontés à un monde de l’édition musicale en rapide expansion, saisirent l’opportunité de voir leur musique imprimée. Les catalogues de l’époque recèlent une quantité véritablement importante de musique pour piano domestique et de mélodies, dont des futilités comme La Bataille de Prague, avec coups de canon et cris des blessés. Mais les éditeurs trouvèrent également de la place pour de grandes œuvres de concert, telles les symphonies de Haydn, et, plus surprenant, pour les concertos les plus virtuoses. Une grande part de ce répertoire posait des problèmes techniques effroyables, du moins pour une époque antérieure à Paganini; car si les concertos pour violon de Mozart avaient été publiés de son vivant, ils seraient certainement apparus comme techniquement fort simples. Il est difficile d’imaginer des amateurs comprenant grand-chose à ces concertos ardus, mais le fait de les avoir achetés a certainement assuré leur survivance. Les éditeurs parisiens se montrèrent particulièrement prolifiques en ce domaine; à Londres, les concertos pour violon parurent souvent dans des arrangements pour piano, davantage vendables. Fait typique, et Viotti et Fiorillo tentent de captiver l’attention par un mélange de virtuosité éclatante, d’expressivité et d’attrait mélodique. L’entrée soliste de Fiorillo n’orne pas seulement l’idée orchestrale initiale, elle l’entreîne dans les sphères supérieures de la chanterelle. Quant à Viotti, il trouve un geste encore plus saisissant: le violoniste entre sans accompagnement, avec une péremptoire version de la ligne de basse d’ouverture. Il opte également pour la chanterelle, mais transfère bientôt l’idée à la corde de sol, un timbre qu’il contribua beaucoup à populariser. Les deux premiers mouvements suivent un trajet grosso modo similaire: tous deux mettent en valeur une démonstration de bravoure assortie de paragraphes mélodiques contrastants, dont un second sujet lyrique et un épisode en mineur, davantage passionné. Le mouvement lent était ordinairement soit une gracieuse romance française, à la mélodie régulière et à la structure aisément appréhendable, soit une longue cantilène expressive. Le Larghetto de Fiorillo recèle un peu du caractère de la romance, mais la charmante mélodie est plus qu’une petite réminiscence mozartienne. Dans le même temps, Viotti se départait des formes standard, et son Andante, tout en conservant un schéma simple, se préoccupe davantage du noble cantabile inhérent à l’archet de Tourte; la chaude sonorité du mouvement est directement issue du son des cors. À cette époque, les derniers mouvements étaient presque toujours des rondos, mettant en scène une mélodie récurrente, avec quelque rythme caractéristique. Fiorillo trouve un air facile à retenir, à 2/4, qui alterne avec des épisodes extravertis, ostentatoires—l’un d’entre eux fait un usage saisissant des cors en dialogue avec le soliste, idée insolite à une époque où les vents étaient souvent considérés comme optionnels. Viotti préfère la mesure ternaire du menuet—même s’il s’agit non d’une majestueuse danse de cour mais d’une polonaise plutôt enlevée. Les airs nationaux piquants étaient assez couram­ment requis comme thèmes de rondo, mais ce mouvement particulier suscita une mode pour le finale de forme polonaise; et, dans un curieux renversement de la norme, la mélodie devint une chanson extrêmement populaire. De nouveau, les épisodes comportent quelques passages brillants (dont une étincelante combinaison trille/rythme pointé), mais Fiorillo trouve, une fois encore, le temps pour un contraste en mineur. Ultime surprise, le thème de rondo revient, pour la dernière fois, à l’orchestre, désormais accompagné par cette figure distinctive de la partie de violon soliste. Das achtzehnte Jahrhundert war die erste große Epoche des reisenden Virtuosen, und Geiger—insbesondere italienische Geiger—machten den Anfang. Zu Beginn des Jahrhunderts verbrachten Virtuosen wie Geminiani, Veracini und Locatelli einen Großteil ihres Leben außerhalb Italiens, und später folgten ihnen Giardini, Lolli, Giornovichi und viele andere. Sie opferten die relative Sicher­heit eines Postens an einem italienischen Hof oder in einem Opernorchester der Aussicht, es in den Hauptstädten Nordeuropas zu Ruhm und Wohlstand zu bringen—in reizvollen Städten wie Paris, London oder St. Petersburg. Das war ein unsicheres Leben. Es bot reichlich Gelegenheit zum finanziellen Ruin, schon gar, wenn sich der Geiger auf riskante Opernprojekte einließ. Er war abhängig von der Billigung seiner Gönner und den Launen der Mode, von politischen Umwälzungen ganz zu schweigen—Viotti war einer von vielen, die sich Anfang der 1790er Jahre aus den Revolutionswirren von Paris nach London retteten. Andererseits konnte ein Virtuose mit Urteilsvermögen und ein wenig Glück sicher sein, im Norden ein bequemeres Leben zu führen und sich vielleicht irgendwann mit dem Lohn seines Erfolges in seiner Heimat zur Ruhe zu setzen. Giovanni Battista Viotti (1755–1824) war einer der letzten, die diesen lukrativen Weg beschritten. (Mit der eklatanten Ausnahme Paganinis erwies sich das neunzehnte Jahrhundert als magere Zeit für die italienische Schule des Violinspiels.) Viotti studierte bei Pugnani in Turin, und nachdem er fünf Jahre im Orchester der königlichen Kapelle gespielt hatte, unternahm er zusammen mit seinem Lehrer eine ambitionierte Europatournee. Sie besuchten Dresden, Berlin, Warschau und St. Petersburg, wo Viotti sich als „Schüler des berühmten Pugnani“ bezeichnete. Sein Pariser Debüt erwies sich als Wendepunkt—eine Konzertdarbietung in den Räumen der angesehenen Concerts spirituels am 17. März 1782 löste eine Sensation aus. Kritiker äußerten sich über Viottis außerordentliche Kraft und technische Präzision, doch es war sein ausdrucks- und klangvolles Adagiospiel, das am meisten beeindruckte. Viotti wurde fortan als der beste Geiger Europas gepriesen. Damit begann ein Jahrzehnt in Paris, das für das Violinspiel von ungeheurer Bedeutung war. Viottis grandioser Stil, der kühne Brillanz mit ernsthafterem, intensiverem Ausdruck verband, bedeutete eine Abkehr von der dekorativen Eleganz des Rokoko. Sowohl seine Darbietungen als auch seine Musik beeinflußten eine ganze Generation von Geigern—Rode, Baillot, Kreutzer, um nur einige zu nennen—, und selbst Beethoven gibt in seinem Violinkonzert zu erkennen, daß er mit Viottis Stil vertraut war. Auch das Instrument selbst machte um diese Zeit Veränderungen durch, da die Hersteller der Forderung nach mehr Lautstärke und ergiebigeren Ausdrucksmitteln nachkamen. Die 1780er Jahre erlebten insbesondere die Vervollkommnung des modernen Bogens durch François Tourte—eine Entwicklung, mit der Viotti traditionell in Verbindung gebracht wird. Auch wenn unklar bleibt, welche Rolle er dabei genau gespielt hat, ist doch die gedankliche Assoziation ein Hinweis darauf, wie hoch sein Ansehen war. Ganze achtzehn Monate nach seinem Pariser Debüt zog sich Viotti dort aus dem öffentlichen Konzertleben zurück—er trat 1784 in Versailles in den Dienst Marie Antoinettes, und später betätigte er sich mit ungewöhnlich großem Erfolg als Opernveranstalter. Immerhin komponierte er weiter Violin­konzerte, von denen er vor seiner Flucht nach London neunzehn fertigstellte. Das 1788 veröffentlichte Konzert Nr. 13 wurde wahrscheinlich für Versailles geschrieben. Die übrigen zehn Konzerte stammen aus seinen Londoner Jahren—darunter die bekannte Nr. 22, die der gestrenge Kritiker Brahms als meisterhaft und eines seiner Lieblingsstücke bezeichnete. Eine eher schemenhafte Gestalt und gewiß weniger einflußreich war Viottis Zeitgenosse Federigo Fiorillo (1755 bis nach 1823). Er wurde in Deutschland geboren und bevorzugte zunächst die Mandoline, doch Fiorillos spätere Laufbahn als Violinvirtuose wies starke Ähnlichkeit mit der Viottis auf. Als erstes unternahm er eine ausgedehnte Konzert­reise nach St. Petersburg, Polen und Riga; dann gab er 1785 sein Pariser Debüt, und drei Jahre später ließ er sich endgültig in London nieder. Ebenso wie Viotti hat Fiorillo große Mengen Violinmusik komponiert, darunter 36 Capricen, die Violinschülern bis auf den heutigen Tag geläufig sind. Seine vier Konzerte sind weniger vertraut; das erste erschien 1789 in Paris. Wir können uns wahrhaft glücklich schätzen, daß aus dieser Zeit überhaupt so viele Violinkonzerte erhalten sind. Virtuosen, die im allgemeinen ihre eigenen Kompositionen spielten, hüteten diese eifersüchtig und führten die zugehörigen Parts in Manuskriptform mit sich; die meisten sind seither verlorengegangen. Dieser natürlichen Vorsicht stand jedoch ein starkes kommerzielles Interesse entgegen: Das Musikverlagswesen befand sich im Aufschwung, und viele Geiger ergriffen die Gelegenheit, ihre Werke drucken zu lassen. Verlagskataloge aus der damaligen Zeit enthalten eine große Zahl von Klavierstücken und Liedern für den Hausgebrauch, darunter auch Bagatellen wie Die Schlacht von Prag samt Kanonendonner und den Schreien der Verwundeten. Die Verleger fanden jedoch auch Platz für die Veröffentlichung bedeutender Konzertwerke wie die Sinfonien Haydns, und überraschenderweise auch für die meisten virtuosen Konzerte. Große Teile dieses Repertoires waren haarsträubend schwierig, zumindest nach den Kriterien der Zeit vor Paganini; wären Mozarts Violinkonzerte zu seinen Lebzeiten erschienen, wären sie als technisch wenig anspruchsvoll aufgefallen. Man kann sich nur schwer vorstellen, daß adlige Amateure mit diesen schwer zu spielenden Konzerten viel anfangen konnten, doch hat die Tatsache, daß sie sie kauften, ihr Überleben gesichert. Pariser Verleger taten sich auf diesem Gebiet besonders hervor; in London wurden Violinkonzerte oft in leichter verkäuflichen Klavierbearbeitungen herausgegeben. Sowohl Viotti als auch Fiorillo sind typischerweise bemüht, mit einer Mischung aus glanzvoller Virtuosität, Expressivität und melodischem Reiz die Aufmerksamkeit zu fesseln. Bei Fiorillo verziert der Einsatz des Solisten nicht nur das anfängliche Orchestermotiv, sondern versetzt es auch in die höheren Sphären der E-Saite. Viotti gelingt eine noch bemerkenswertere Geste, indem er den Violinisten ohne Begleitung mit einer bekräftigenden Variante der einleitenden Baßlinie anfangen läßt; er wählt ebenfalls die E-Saite, verlagert das Motiv jedoch bald auf die G-Saite und in ein von ihm bevorzugtes Timbre, dessen Popularität unter anderem ihm zu verdanken ist. Der langsame Satz war gewöhnlich entweder eine anmutige französische Romanze mit regelmäßiger Melodie und leicht erfaßbarer Struktur oder eine langatmig ausdrucksvolle Kantilene. Fiorillos Larghetto hat etwas vom Charakter einer Romanze, doch die charmante Melodie erinnert eindeutig an Mozart. Viotti war um jene Zeit dabei, sich von den Standardvorlagen zu lösen. So hat sein Andante zwar nach wie vor einen schlichten Aufbau, ist jedoch vor allem um das edle Cantabile bemüht, das dem Tourte-Bogen eigen ist; die warme Sonorität des Satzes entspringt direkt dem Klang der Hörner. Schlußsätze waren seinerzeit fast ausnahmslos Rondos mit einer wiederkehrenden Melodie in typischem Rhythmus. Fiorillo erfindet eine zündende Weise im 2/4-Takt, die mit protzig extrovertierten Episoden abwechselt; eine davon läßt auf eindrucksvolle Art die Hörner zum Dialog mit dem Solisten antreten, eine ungewöhnliche Idee für eine Zeit, in der die Verwendung von Blasinstrumenten noch keineswegs immer zwingend vorgeschrieben war. Viotti zieht den Dreiertakt des Menuetts vor—das jedoch kein getragener höfischer Tanz ist, sondern eher eine beschwingte Polonaise. Reizvolle heimische Melodien waren damals als Rondothemen verbreitet, aber dieser Satz löste eine Vorliebe für Finalsätze in Form einer Polonaise aus, und in kurioser Umkehr der Norm wurde sein Thema als Gesangsstück höchst populär. Auch hier enthalten die Episoden einiges an brillantem Passagenwerk (ein Motiv ist eine auffällige Kombination aus Triller und punktiertem Rhythmus), doch findet Fiorillo erneut Zeit für einen Moll­kontrast. Und eine abschließende Überraschung gibt es auch—wenn das Rondothema zum letzten Mal wiederkehrt, ist es im Orchester zu hören, diesmal begleitet von der beschriebenen auffälligen Figur im Soloviolinpart.